X is for X, The Identity Of. X is the murderer, and his (or her) identity will be revealed in this post! If, dear reader, you are joining us for the first time- may I advise you not to read this post yet? It is, I fear, taking a Liberty; however, if you will allow me- here is a fine Introduction– always an excellent place to start, I think. Or, if you are feeling Adventurous, we have a Table of Contents as well. If you are not sure whether or not you are interested in reading Alas! : A Complete Mystery Novelette in 26 Alphabetical Installments, perhaps a few Illustrations will whet your appetite. If so, may I direct you to the Additional Character Pictures page? A word of explanation about this last offering: every day this April (except on Sundays- otherwise the numbers don’t work out! ), I have dressed up as the character featured in the post I have written for that day. 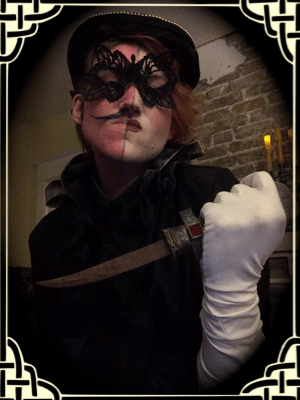 I have taken many pictures of myself in each costume, and in the Additional Character Pictures page, I have posted several of these. This gallery is, as yet, not complete, but more pictures will be added. And if you like your mysteries to come with a map, with an X marking the spot where the body was found, here is a fine example, hand-drawn by yours truly. Well, Inspector Crowner thought, here they all are, all of the suspects in this irritating case, plus some supernumeraries (witnesses, Interested Parties, and a couple of people who seemed to have simply wandered in) and a few assorted officers of the law. They were all crammed into the drawing room of Cadblister Hall, and they were all waiting for him to begin. There, on a makeshift bed, sitting up now, was Richard Crabtree, aka Herman T. Ermyntrude. He was weak, from blood loss and from the poisoning, but he was Not Dead, which was something. On a second cot lay Aunt Theodolinda, now out of her coma and taking a lively interest in the proceedings. Between these two invalids, Doctor Brandwood sat on a chair he had personally raided from Cadblister Hall’s beautiful dining room, his medical kit open on a table before him, Ready for Anything. Mrs. Goodkind the witch, whom no one had quite dared to eject, sat complacently in an armchair by the fire, sucking at her horrible pipe and blowing, now and then, a smoke-ring. Crowner’s eye travelled to the back of the room. He’d positioned Constable Wilkins in front of the entrance to the secret passage, and if anyone got past him, Crowner would personally flay Wilkins and then take his badge. Constable Wilkins had been apprised of this, and he watched the proceedings with a look both alert and alarmed, ready to thwart all Funny Business. Also at the back of the room were several representatives of the Servants’ Hall. Kate, the intelligent kitchen maid, was present, to reward her for helping the police. Alfie the Boots, on the other hand, was present because he’d been such a nuisance that even now suspicion that he’d murdered Lord Cadblister hovered nebulously in the minds of certain dim-witted persons – for example, the Chief Constable. Finally, Sneakfork was present, presumably as a sort of ambassador from Below Stairs. About him hovered, at any rate, a sort of aura of officialdom, and Crowner was not inclined to attempt to dissipate this. All three servants stood, having refused the seats that Crowner had arranged for them. Some sort of etiquette, Crowner surmised, made it unthinkable for the servants to sit in the presence of their employers. Well, he could stand their standing if they could. At the drawing room door, Sergeant Mug stood guard. He looked resolute and disinterested, but this was merely Wearing the Mask. Crowner was certain that Mug was inwardly doing cart-wheels and clapping his little hands together in girlish glee, at the Drama that was about to unfold before his eyes. Well, Mug was a good sort, and, if he could take pleasure in this sort of thing, Crowner wasn’t the man to object. In fact, Crowner occasionally had the uncomfortable feeling that he sometimes played up a bit to his Sergeant’s tastes. He was such a good audience, and really, he didn’t ask for much, when you looked at the thing squarely. Colonel Crabbit, the Chief Constable, had positioned himself, Crowner suspected, with some care. The Colonel sat with Mrs. Merriweather, Miss Bantree, and Miss Bantree’s niece, the little journalist creature. In other words, Crabbit had planted himself firmly amongst the Gentry, and thus had avoided alliance either with the noble Crabtrees, around which much suspicion had lately gathered, or with the police, who might shortly be arresting the Colonel’s lady-love, the Countess. Yes, it seemed a deliberate move, and a bit unchivalrous. Could the Colonel, perhaps, have gotten a glimpse of the Countess’s true character? If so, he was a brave man not to run screaming out of the country, Crowner considered. On a sofa sat the Vicar, his daughter Verity, and Randall Grudge. Verity looked profoundly unhappy, and no wonder, thought Crowner, if the rumours about her almost-engagement with the Viscount were true. She certainly wasn’t almost-engaged to him now. Randall, perhaps aware of this discomfort, or perhaps simply because he was aware of his status as an outsider in what had been the home of his father, looked defiant. The Vicar looked benevolent and mildly interested in the proceedings. And finally Crowner looked towards the western wall of the room, where the three Crabtrees sat in an almost regal isolation, in three chairs that were built into the paneling of the room. There was a fourth, empty chair, next to the Countess. Few of the people in the room met the eyes of these three stately, miserable figures. The Countess had drawn herself up straight, and her eyes of ice glittered haughty disdain behind her widow’s veil. Odd, that, Crowner reflected. Most women, he believed, would, when inside, put the veil up. But perhaps this particular widow had much she wished to keep secret. The Viscount frankly squirmed in his throne-like chair, like a small boy sitting through a long sermon. And Lady Belinda slumped in her chair, and stared in front of her with misery writ plain upon her face, for all to see. Outside, the night was very dark. Clouds had been gathering all through the afternoon, and now, not a single star shone in the heavens. Soon, it would snow, and snow hard- if it had not started to snow already. And now Crowner, satisfied with the suspense he’d generated by his long scrutiny of the room and all of its occupants, stepped forward, to stand in front of the fire. No one said a word. Good. Someone in the room let out a little cry, quickly smothered. Crowner smiled grimly. “What?” It came as a plaintive, desperate cry. But the Viscount understood, even if his sister did not. There was the sound of screaming hinges, and suddenly his throne-like chair had disappeared into the wall behind him. Can’t wait for the rest to be revealed! A little more will be revealed today, and Z will do the rest… and if I miss any loose ends in the Big Tie-Up, please let me know, and I’ll either add it in somewhere or write an Epilogue.